You are currently browsing the category archive for the ‘Pruning 101’ category. 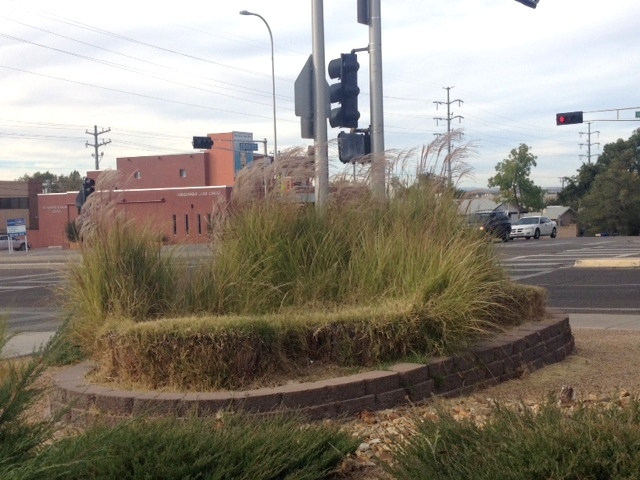 Hmmm…well this grouping of grasses is certainly not attractive. Bad pruning and even poorer maintenance are the problems. I understand that it’s easy to use a hedge trimmer to whack the grasses. But that’s lazy maintenance. And results in ugly “tabletop-like” grasses. If the landscapers are going to use trimmers like that, they should at least trim them down shorter so they don’t look so terrible. The bad pruning can also lead to the grass’s death. In the above photo, half the grass didn’t survive the whack job – you can see it’s all brown down below. That grass is not coming back to life. The other problem is that the grasses need to be thinned so that new growth has the space it needs. But of course, dividing the clumps takes time, and no one wants to pay for that. So the grasses suffer. And my eyes suffer, too! One thing I’ve learned in my plant care business is that a lot of people are scared to prune their houseplants. I know, I know, it’s more fun to watch new leaves unfurl than it is to pinch back new growth, or to prune off branches or stems. It’s fun to see if a vine will wrap itself around the kitchen cabinets. Each leaf seems to be prettier than the one before, so how are you supposed to cut any of them off? Also, some plants are hard to prune. I get that, too. Remember when Tina and I had to prune back the cactus at KOBtv? Brutal! All that aside, if you’re one of those people who is too chicken to prune, you need to get over it. Sorry, it’s true. For the majority of houseplants (excluding the big ones), a good pruning is like a manicure: A manicure isn’t absolutely necessary for your nails, but if you want really healthy nails, a manicure promotes that. Plants are the same way – a little grooming goes a long way. Each time you cut a portion of your plant back, you’re promoting a healthier, fuller plant. The plant won’t die if you don’t prune it, but it won’t be as healthy as it could be. I’m working on a post about pruning – the how-tos, when-tos and which plants need tos – in the coming weeks. There’s one simple rule I can share with you right now: Think small. When pruning a houseplant, which is fairly small to begin with, the goal is not to hack the plant to pieces. The goal is to prune little by little. Remove a remove scraggly spot here, pinch back new growth there. If a vine gets too long, cut it back. Where you make the cut, depending on what type of plant you’re pruning, you should get at least two new shoots, which is how your houseplant will get bushier. Could you cut back even more of the vines? Sure. But my point is that pruning shouldn’t be an overwhelming task. It should be part of your regular maintenance routine. Another reason to prune little by little is so you can develop confidence and experience. By removing only one vine, you can watch where the cut was made, and see new leaves emerge in the weeks following. You’ll see that the plant’s fine, and that the cuttings are doing well, too. The cuttings – one awesome advantage to cutting back a plant is that you can root the cuttings and begin new plants. For free! Boring. But look what a little green can do – voilà! Muuuuuuuch snazzier now. The roots will start growing quickly and in just a few weeks, I can use these cuttings to start new plants. I’ve found that pruning becomes a whole lot less intimidating if you know you can get new plants from the effort.